Recent unconfirmed but credible reports that His Holiness the Dalai Lama will open the climactic last day of this year's Glastonbury Festival do not come as a surprise. Last year I was able to observe His Holiness at close range during his Kalachakra teachings in Jammu and Kashmir. That experience prompted me to write about how the Dalai Lama's love affair with the Western media is strangely at variance with the concept of ego-death - anatta - which is central to Buddhism, and how he is eager to use egocentric show business personalities to front his appearances in the West. It is not without reason that The Daily Beast hailed the Dalai Lama as a "Twitter rock star". 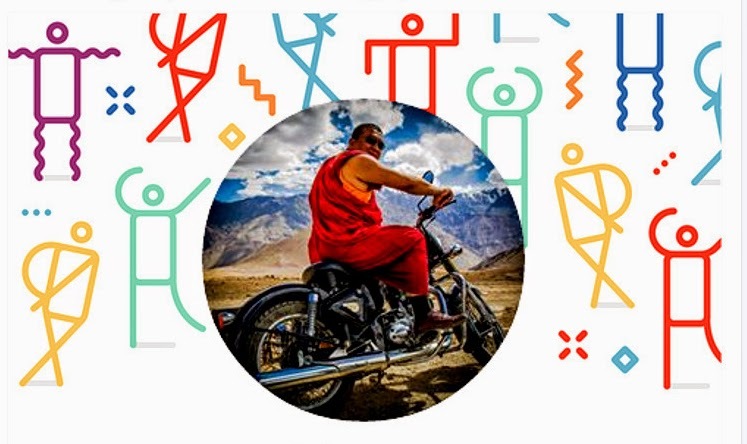 The pursuit of ego-death does not deter His Holiness and those around him from embracing social media with a fervor that puts many rock stars in the shade, and that unedited header image comes from the selfie saturated Facebook page of a member of the Dalai Lama's inner circle. The Chinese invasion of Tibet and the subsequent cultural genocide is a tragedy, and the West's refusal to confront China with their crimes is a scandal. But the damage to Tibet is now irreparable and the West's love affair with the Chinese economy is irreversible. His Holiness has stated: "I don't want to convert people to Buddhism - all major religions, when understood properly, have the same potential for good". So why is he appearing at the Glastonbury Festival? Ticket prices for Glastonbury 2015 are £225 per person, a hospitality yurt for four people costs £11,394, and past sponsors have included brewing giant Carlsberg and multi-national mobile phone operator Orange, both corporations with extensive business interests in China. Details of the Tibetan government-in-exiles finances make illuminating reading; but I am quite sure the Dalai Lama is not benefiting personally from his Festival appearance. But are there not better ways to preserve the priceless Tibetan Buddhist tradition than publicly embracing the forces of excess and celebrity that are destroying it? I travelled to India last year wanting to be bowled over by the Dalai Lama and the venerable tradition that he has been instrumental in keeping alive. But as I explained in my essay about the visit, my spirit quest to Ladak enlightened me in unexpected ways. I believe implicitly in the Buddha's Four Noble Truths and my admiration for the Dalai Lama's past work in championing the Tibetan cause is boundless. However, the prospect of the acclaimed Nobel Peace Prize laureate morphing into Glastonbury headline act saddens me. His Holiness should take note of what happened to another spiritual leader. In 1969 Sri Swami Satchidananda, a guru whose disciples included musicians Carole King and Paul Winter, appeared at the Woodstock Festival. Later, the Swami's ownership of an antique Cadillac and a cherry red Rolls-Royce were the least of the problems that the spiritual leader with a taste for the rock star lifestyle had to contend with. In a recent tweet to his 10.1 million Twitter followers, the Dalai Lama told them that: "True friendship develops not as a result of money and power but on the basis of genuine human affection". If his Glastonbury appearance is confirmed, will His Holiness exhort his followers to emulate Woodstock by breaking down the fences and turning Glastonbury into a free festival? If he does, a lot of people who cannot afford £225 or who had the cash but lost out in the Glastonbury ticket lottery, will benefit from his undoubted wisdom. Rofl :-) Pli, what on earth is an hospitality yurt?! The wonderful essay is online (if you haven't read it). (The lines reminded me of the Qur'anic lines..the desire for more and more overcomes them). Who, today, can escape the system..or must we all shout in unison, as in the famous Monty Python sketch: "je suis.."? Good grief! I never knew living the simple life would be so expensive! The 394 bit I can manage but..er..you couldn't spot me a few pounds, could you Bob? I love the idea of an 'onsite management team'! Hostesses? Get out of here! Even worse, I now hear that you can do a 'five-star Hajj' with all the comforts of 24/7 cable television and great views from the hotel.